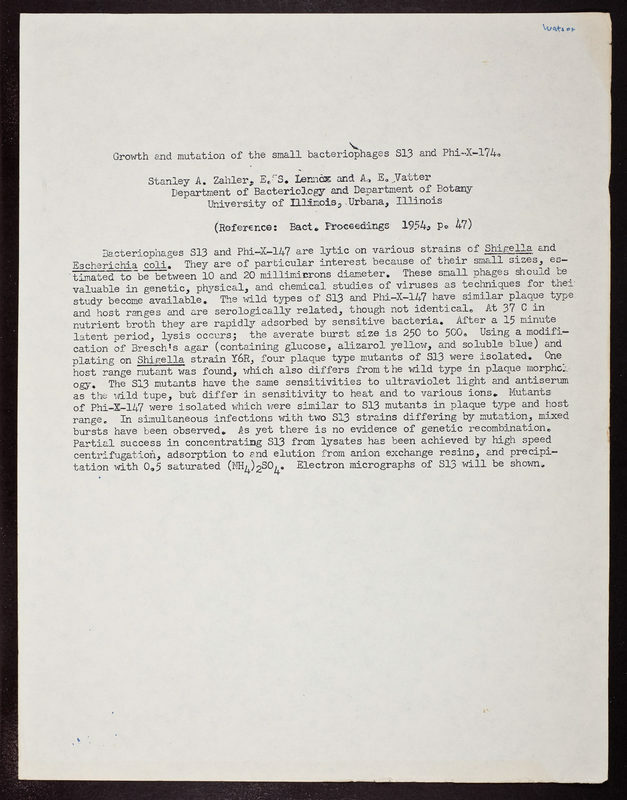 Bacteriophages~ Lennox, E. S. (Edwin Samuel), 1920-~ Vatter, A.E.~ Watson, James D., 1928-~ Zahler, Stanley A.
Zahler, Stanley A., “Abstract: "Growth and mutation of the small bacteriophages S13 and Phi-X-174" by Stanley A. Zahler, E.S. Lennox, and A.E. Vatter,” CSHL Archives Repository, Reference JDW/2/2/1852/9, accessed April 18, 2019, http://libgallery.cshl.edu/items/show/88443.